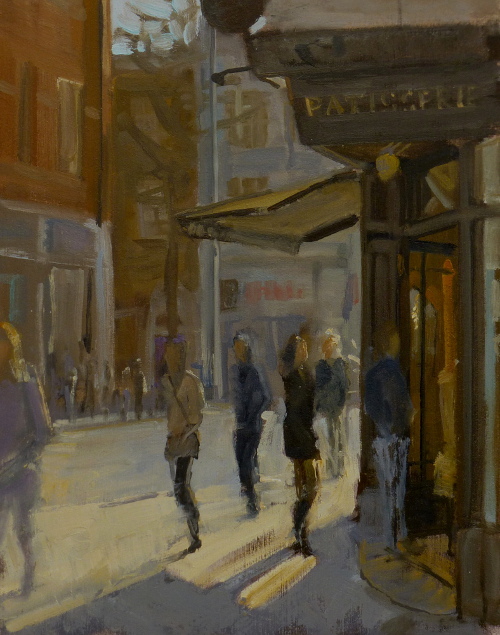 This plein air painting of the popular Paul Bakery on the King’s Road in Chelsea is now available to buy from my exhibition at Island Fine Arts. The show is on until 29th March 2014. 31.5 x 23.5 inches. Oil on Canvas. I have wanted to paint this view for several years and yesterday – I did. Last week, I painted a small study of this view along Northumberland Avenue and then went back with a large canvas and managed to get it down in one hit, en plein air, yesterday evening. W H Patterson gallery in Mayfair. Afterwards I went down to The Mall and painted some of the flags that line the route. Painting in the street always draws onlookers and I am quite used to being photographed while I work. 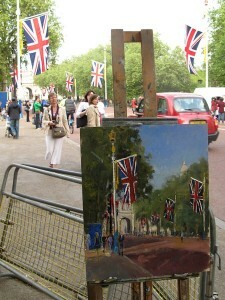 As I was painting this picture I was filmed by BBC TV and interviewed by BBC Radio. 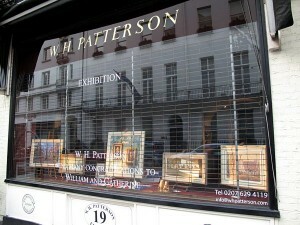 above: Window display – paintings by Roy Connelly, Peter van Breda and others. 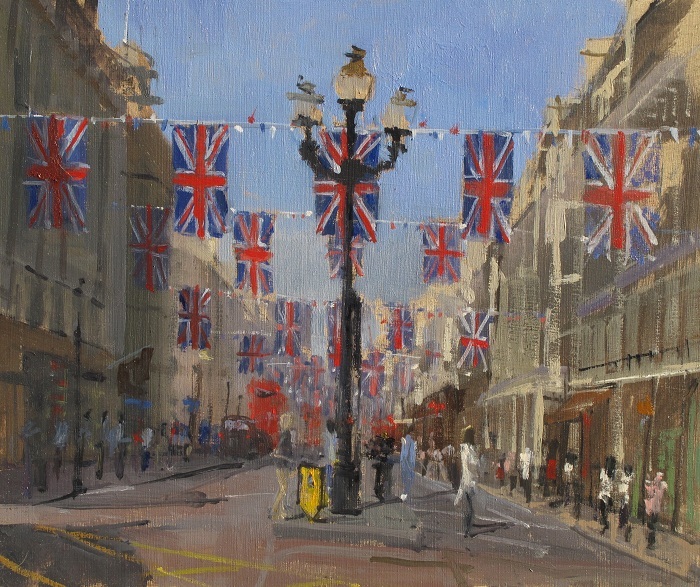 Yesterday I painted Regent Street which has been hung with 200 Union Flags to celebrate the Royal Wedding. I spent several hours standing on a traffic island and was photographed by several news agency photographers who were out looking for some pre-wedding colour. 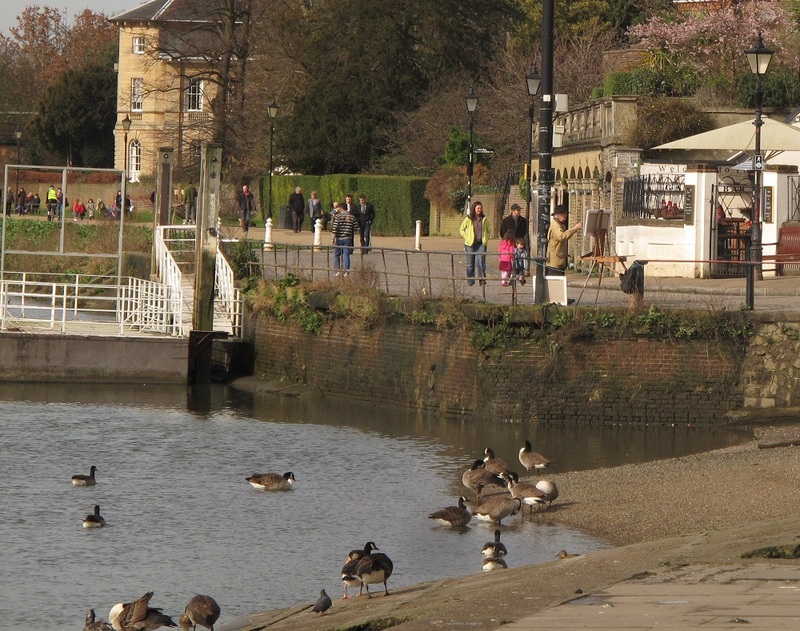 The more successful plein air painters I know tend to be solitary figures but in the last couple of weeks several of us seem to have chosen the same stretch of the Thames to work on. 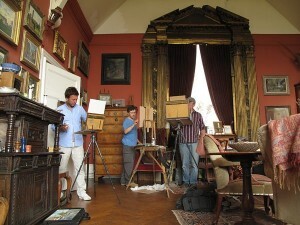 This week I was painting at Richmond and fellow painters Ken Howard RA and John Dobbs were there too (photo above). Earlier, I was painting at one end of Strand on the Green and Pete the Street (Peter Brown NEAC) was painting at the other. There must be something about the winter light on the River Thames that we find compelling. The picture above is one of several oil paintings of London I will be exhibiting at Llewellyn Alexander. The show will feature familiar and unusual scenes of London by this group of 9 well-established artists: Dianne Branscombe, Roy Connelly, Lisa Graa Jensen, Mark Harrison, Terry McKivragan, Liam O’Farrell, Nancy Petley-Jones, Nadia Tsakova and Robert E Wells. Oils & Watercolours. 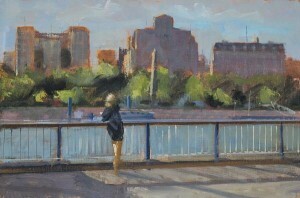 Watching the River, oil on board, which was exhibited in the London Lives painting competition at Bankside Gallery is now for sale available from Island Fine Arts. Back in August, I spent a morning painting in the upstairs studio of the former home of John Singer Sargent in Tite Street, Chelsea. It was thanks to the kindness of artist Julian Barrow, the current owner, that we were allowed to paint in this remarkable historic setting. Other well known painters to have used these studios include James McNeill Whistler, Augustus John and Norman Hepple. 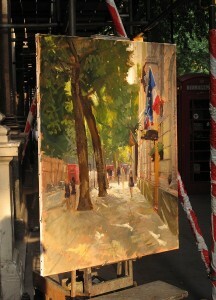 Since 2008, LondonOilPainings.com has been the place to find original oil paintings of London. 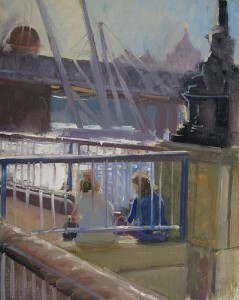 The site now has a brand new look and I hope you will enjoy looking through my collection of plein air scenes of London. London scenes painted on location by professional artist Roy Connelly. Where to buy original paintings. Fine Art galleries showing London paintings by Roy Connelly.